Ever since i returned from Bangalore last month, this recipe was on my “to make” list. 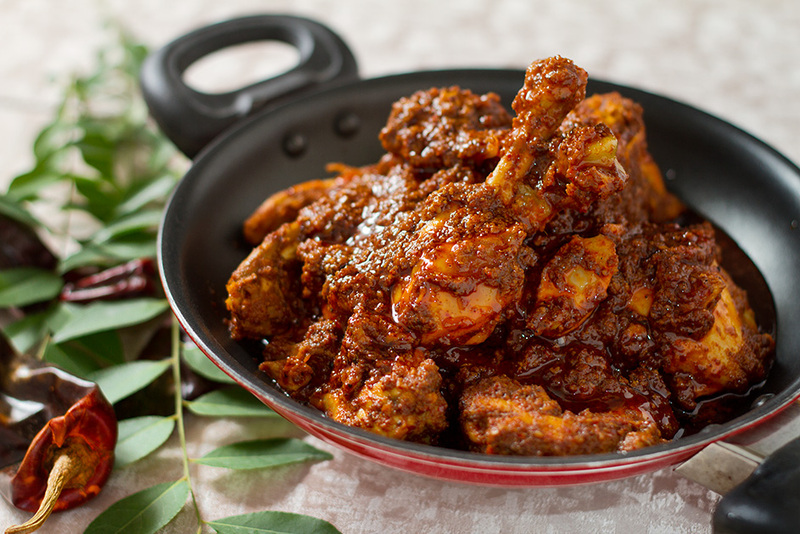 Chicken ghee roast is a very popular Mangalorean dish and is an absolute delight to eat. Pair it with Neer Dosa or Appam and it makes for an awesome meal. And if you can’t, serve the Chicken Ghee Roast with sambhar and ghee rice for a lovely weekend brunch. The ghee roast originated in a small town called Kundapur near Mangalore. The ghee flavored fiery red, tangy and spicy dish soon became very popular and is available in restaurants across Karnataka. The Chicken Ghee Roast is made in Ghee (Clarified butter). Read about benefits of ghee here. Try not to skimp on Ghee for this recipe. The use of ghee gives the dish it’s flavour and makes it delectable. To make the dish look colourful use the Kashmiri chilies. The cuisine of Tulu Nadu region of India which comprises cuisines like Udupi as well as cuisine of other Mangalorean communities like that of the Mogaveeras, Billavas, Bunts, Saraswat Brahmins, Mangalorean Catholics and the Bearys is collectively called Mangalorean Cuisine. The cuisine of Mangalore would remain incomplete without usage of rice. Rice is cooked in various forms such as pancakes, wafer thin rice rottis served with chicken curry, grain rice, sannas i.e., idlis fluffed with toddy or yeast, neer dosa, etc. A remarkable feature of the Mangalorean sweet dishes is that instead of using sugar, Mangaloreans use jaggery made of palm so as to keep themselves healthy. Moreover, this sweet syrup has a fragrance and taste of its own and thereby makes the Payasam more delicious. Moreover, the three main things that add flavor to the various dishes of Mangalore are raw mango, tamarind and kokum. 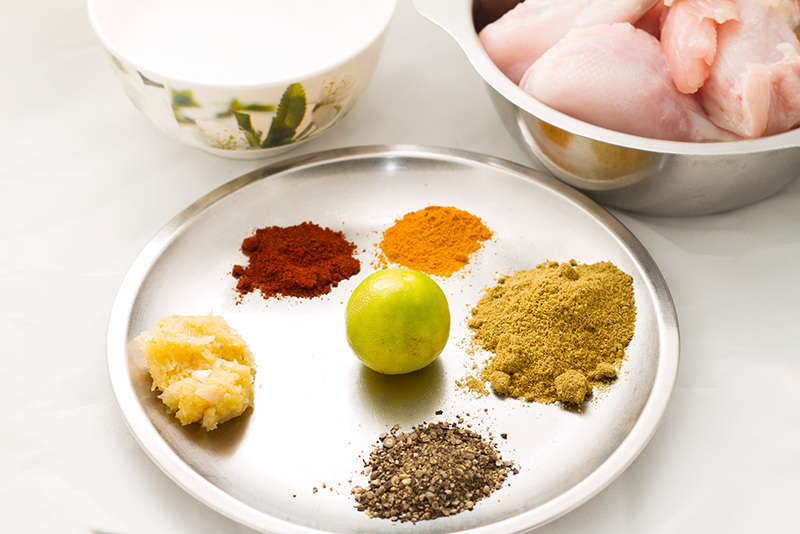 Wash and cut chicken into bite size pieces and marinade it in yogurt, ginger and garlic paste, coriander powder, pepper powder, Red Chile powder, turmeric, 1 Tsp salt and lime juice. Keep the marinated chicken on table top for about an hour. In a pan heat 1 Tbsp ghee and add to it 15 garlic pods, fennel seeds, peppercorns, cumin seeds, fenugreek seeds, cinnamon, whole cloves, grated ginger, coriander seeds, and wholekashmiri red chilies. Fry this for about a minute or so, add the tamrind pulp to the pan and about a cup of water. Allow the water to boil for about five minutes so that the masalas get soft. Cool down this mixture and make it into a fine paste. In a heavy bottom pan, add about 1/2 Tsp ghee and the marinated chicken along with the marinade. Cover and cook till the marinade thickens and the chicken cooks. In another heavy bottomed pan, heat the remaining ghee (about 5.5 Tbsp), temper with a handful of curry leaves and add the masala paste along with 1/2 Tsp salt. Allow the masala to get completely fried. 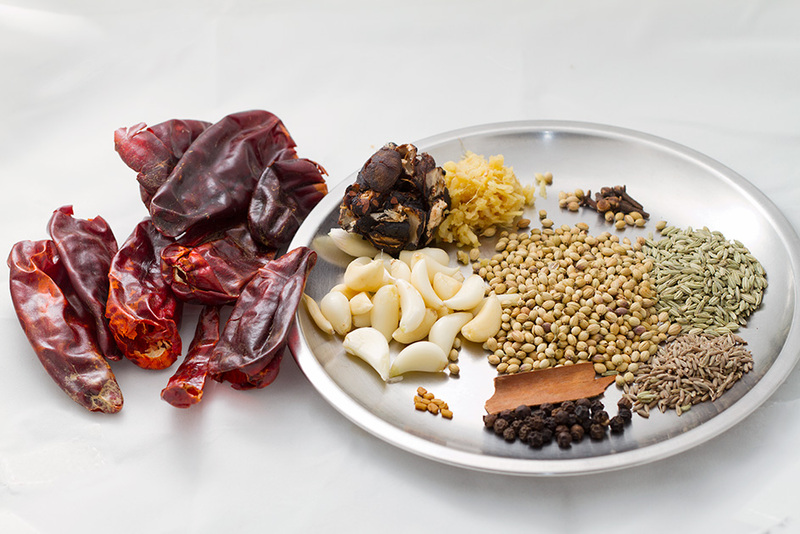 Keep adding water so that the flavors from the aromatic spices blend with each other. The masala is done when you see ghee floating on top of the masala. This take about the same amount of time that takes the chicken marinade to be cooked. Mix the cooked chicken with the fried masala and continue frying for about 10 minutes. Add powdered jaggery and mix well. Taste for salt and adjust if it is less. The chicken should be completely cooked by now and should get coated with a thick layer of masala. You will also see the ghee floating along with the masala. Garnish with curry leaves or coriander and serve hot. Serve Chicken Ghee roast with Neer Dosa or Appams. You can also serve it with Steamed Rice with a dollop of ghee and Sambhar on the side. Watch the video to see the recipe and process of making Appams. The recipe looks interesting to try out. Would mind adding how much water needs to be added to masala please. Being a beginner to cooking, it would help me to get through. Thanks. Do try the recipe. About a cup of water is what you need to add, I have given this in the recipe. Tried this yesterday and it was absolutely delicious! Thank you for an awesome recipe, kudos! Hi Swati, I am newly married n my in laws don’t like the food that I cook. So they never let me cook chicken. This Sunday situation was such that they told me to make chicken. I picked this recepie n was nervous. But when I asked my husband after dinner, “batao aaj kya kam zyada tha, “he replied it was perfect. After hearing this I was very happy. This was a big compliment for me n I want to share it with you. Your recipe is perfect. Thanks for sharing. I am so happy it worked out for you. Here’s to more awesome cooking by you! Thank you. You will need 1 tsp fennel seeds. I have updated it in the recipe. Thanks for pointing out. Thank you. I am glad the recipe works for you. So many thanks for this recipe. What a delight to see my son relish it and rate it very good. It’s always a delight to see children enjoy what we cook, so happy that your son liked it. Absolutely delicious. Everyone wanted more. Enjoyed it very much. Had it with Pulkas. I will definitely make it again. I came across your recipe. However, tried it with mutton instead of chicken n added stevia instead of Jaggery!! It was awesome!! Thanks n happy cooking..
Great post – Am planning to do it! Can the chicken marinade be made and kept overnight in fridge ? Also can I do the same for the masala? Means grind it and keep in fridge and cook the next day ? While you can easily marinate the chicken keep it overnight in the fridge, making the aromatic masala and keeping it overnight will rob some of it’s flavours. Although, you can still do it if you are pressed for time. Or, make everything ready and just grind it the next day when you are ready to cook. CAN WE SKIP THE TAMARIND IN THIS RECIPE. You may skip tamarind but the taste will be different. Amazing recipe, loved it 🙂 thank u! I cooked for my wife she said It’s great really testy recipe and I feel very happy this credit goes to swati. Swati … Superb recipe .. I tried it with 1.2 kg of chicken and altered the recipe a bit in quantity … Turned out so yummy .. I just can’t believe it myself !!! Thank you so much !! The moment I read your recipe, I knew it was a keeper! Just tried it today with boneless chicken thighs cut into bite sized pieces as finger food for a party. The chicken released too much water but patience and faith got me through. The dish is amazingly tasty – in fact, as good as any I’ve had in Mangalore or Kundapur and just got wiped out by my guests. Too bad I didn’t stretch to neer dosa but pita bread worked marvels. Thank you so much! I am so pleased that it worked for you. I can feel you frown, I know it is a big ask, but I have to live with it. I am taking some ayurvedic medicines for which I am not supposed to consume these things for the medicine to take effect. Please try to help me ! All the best Dear Swati I hope your good non veg post will help all newly married couple .as they will try their best at home. Thank you. Cyprian Dantis. Can you please let me know where you found the link to this recipe. Some kind soul has posted it on one of the Facebook groups and I would like to thank them. Pl give print option for your recipes. It was awesome ! Made a gravy by doubling the marinade, extremely tasty … definitely a keeper … many thanks ! Thank you. Will soon post both recipes.